Wow - I've had all the supplies out on my work table to make Tim's November tag for weeks and just haven't had time to get to it! But there are just a few days left in November so it was now or never! Here is Tim's tag and the link to see his tutorial. And here is my version. 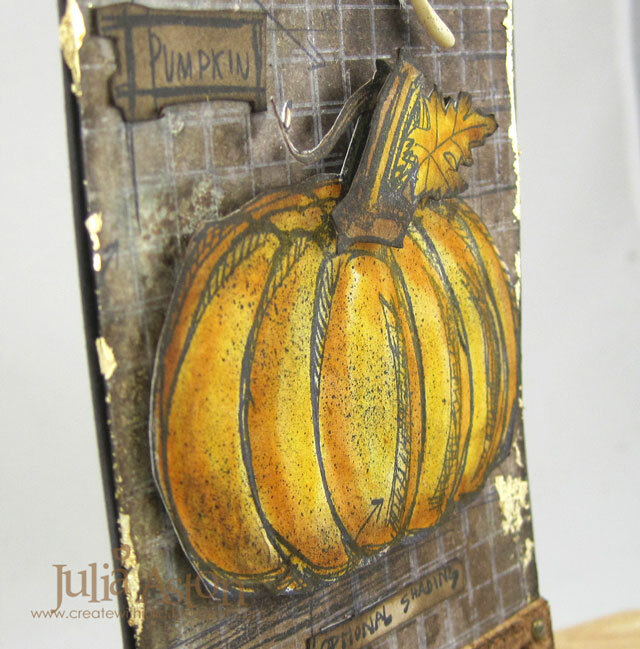 I had a lot of the supplies Tim used but I used a different grid stamp for the background, I used some gold metal leaf that I had in my stash from years ago (and never used!) on the edges. I used a wishbone instead of an arrow at the top. 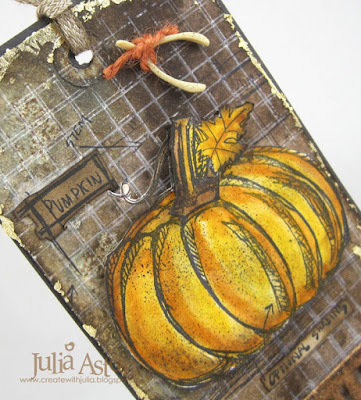 I also stamped and cut out the word 'pumpkin' from the blueprint stamp because it didn't show up on the background with the dark colors. I used a thin piece of real cork to cut out the AUTUMN and also stamped the 'optional shading' from the blueprint stamp on a piece of kraft and added it here beneath the pumpkin, since my stamped one didn't show up on the background. Here you can see the layered stem. I just love the background on this tag. 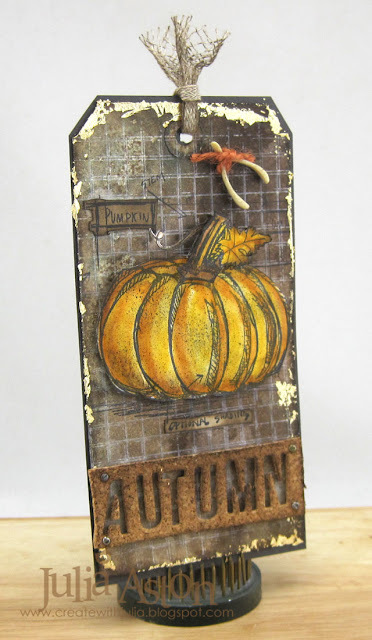 As per Tim's tutorial - you use a brayer to roll Ranger Distress Paint (I used Picket Fence) over the stamp and press it onto the tag (wash your stamp and brayer immediately!) - let the tag dry - spritz water over the tag - then spray 2 colors of Spray Stain (I used Ground Espresso and Iced Spruce) over the tag and dry with your heat tool. L-O-V-E it! 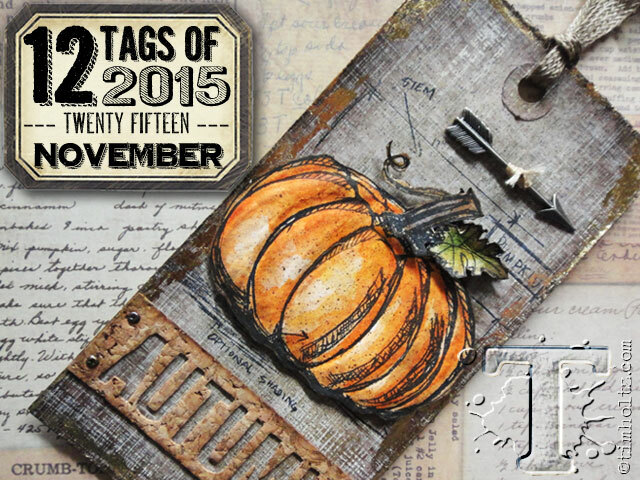 So I've got the November tag done - just in time to find out what the December tag will be next Tues! (I really can't believe it's Dec already??!!!) 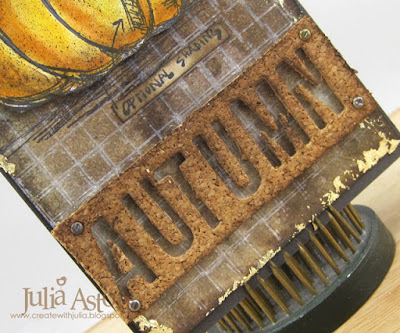 This will, no doubt, be my last fall project of the season - I'll be moving on to Christmas and winter now! Excellent! I love your tag - your version is just perfect! Awesome tag Julia! You did a great job coloring the pumpkin! Hope you and your family had a Happy Thanksgiving! Wow--your version is gorgeous! I love the background!